Greetings from Asheville. Yes, it has been a few days since we departed and I entered my first post for this trip. We have been busy and tired. Here is a short glimpse of our time thus far. 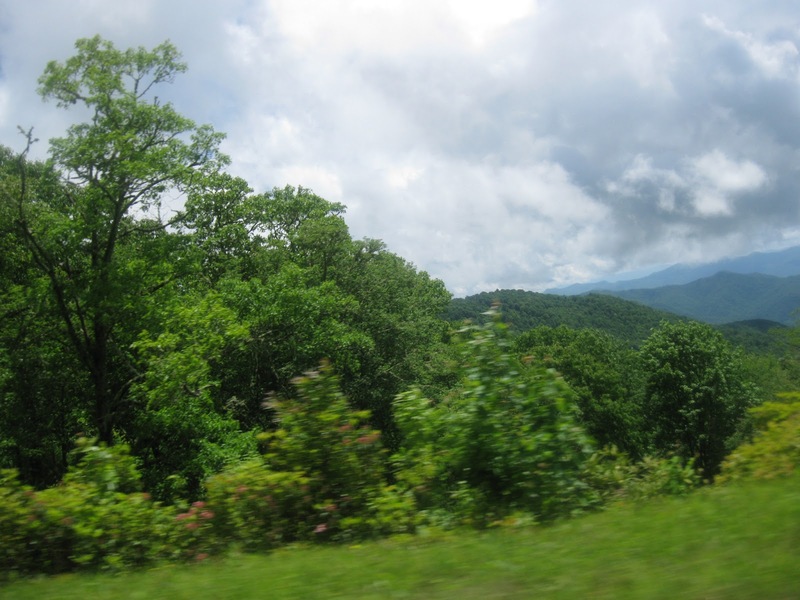 Our drive from ATL to Asheville was mostly uneventful. We met our friends John and Penny on the way north and then joined up with Jack and Kathy in Clayton, GA near the NC border. That first part of the trip was nice with cloudy skies and some light rain. But, as we entered NC, the real rains arrived and it was very wet as we approached Cherokee, NC and the beginning of the Blue Ridge Parkway. Our first problem arose as we were entering Cherokee when my driver's side mirror fell off. No damage and not a real issue. We were joined by Brad, Kim and Matt and their 2 MGA's in Cherokee for lunch and the drive up to Asheville starting on the Parkway. Once we arrived in Asheville, we checked in and went to the First Timers Reception for some snacks and drinks. What a nice way to start the program. Later, we went to dinner with Jack and Kathy and walked around much of the downtown area of Asheville. Tuesday was an early morning. 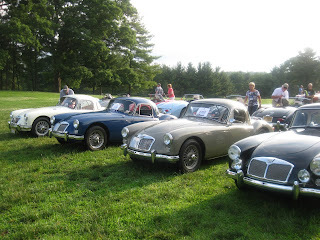 We gathered at 7:00 AM for the short drive to the Biltmore Estate where a group picture was taken in front of the House. Then we were treated to a lovely buffet breakfast and a full tour of the facility. Some tidbits that stuck in my mind. There are 2.4 million Cubic feet under the roof and the indoor swimming pool holds 77 thousand gallons of water and has depths from 3 feet to 9 1/2 feet. Since they didn't have chlorine, it had to be emptied regularly so fresh water could be brought in. Can you imagine? Later in the day a group of us drove a section of the Blue Ridge where we ended up at the Pisgah rest area for a delightful lunch. I had two of my favorites on the same plate - Fresh grilled trout and Mac and cheese. 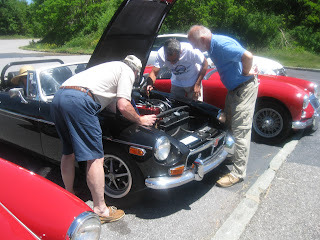 We also had a mini tech session to assist John with the timing on his MGB. Later, a group of us went to the Highlands Brewery and the Troy & Son Distillery for a tasting and tour. The distilled spirits were very smooth and delightful. The beers acceptable when you think that we samples 6 different ones. It was fascinating to see how the tasters all chose different ones as their favorites. Yes, the world is made up of many different tastes and preferences. Tuesday ended with 5 of us doing the walking Brew Pub tour in downtown Asheville. Combining our drinking/tastings with some small plates made for a delightful evening with some live music and pleasant walking. Barbara and I ended with our second visit in as many night to the French Broad Lounge for a chocolate treat. This time we were in line with the woman from Troy & Sons who gave us the tour. We talked with her and her date for a short bit while waiting to place our orders. 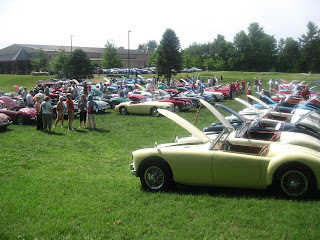 Today is Wednesday so it must be the day for the car show. There were about 180 MG's on the chow field. 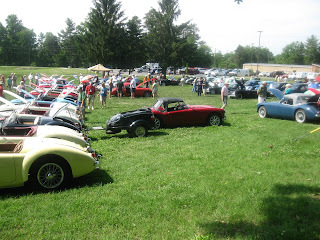 Our MGA Coupe is in the pic at the top of this page so I'm not repeating it here. It was very hot on the field especially as we approached noon and the end of the show. We talked with many people and learned some excellent ideas for improving the quality of the performance of the car and studied the various cars for ideas on changes that we might make. Barbara and I then went to the River Arts District for a walk amongst the galleries and lunch. There was a lovely breeze there which we wish we had on the show field. Oh well. Now we are resting and thinking about how to end our visit in Asheville tonight. Tomorrow we drive to Atlanta, change our bags and head to the airport for the flight to Seattle and our next post.